Although depictions of espionage, intelligence, and related activities in motion pictures have not always tended toward realism, the movies' portrayals of covert operations have to an extent mirrored events in the real world. Through the end of World War II, the activities depicted usually involved Nazis, but by the late 1950s, Hollywood had entered the Cold War espionage genre. Later decades have seen portrayals of terrorism and counterterrorism, as well as intelligence and security operations in futuristic settings. From the 1960s onward, the James Bond movies and other films and television shows have given increasingly whimsical treatments to covert operations. Hence it is ironic that some of what seemed like fanciful spy technology in the Bond movies of another time is now standard equipment, in some cases even within the civilian sector. As early as 1918, with I Want to Forget (starring Evelyn Nesbit, whose involvement in a real-life murder drama would be depicted many years later in the book and film Ragtime ), Hollywood set out to portray spies in film, but most early attempts were less than successful. Pre-World War II films on espionage tended to focus on the romantic and dramatic associations, and offered little in the way of authenticity. Most authentic among the depictions of espionage in this era were the films of Alfred Hitchcock, whose most well-known espionage thrillers of the prewar era included the first version of The Man Who Knew Too Much (1934) and The 39 Steps (1935). These films established a theme that would become a fixture of spy movies thenceforth: the non-spy who stumbles into the middle of a conspiracy and is caught up in events he or she does not fully understand. Usually the non-spy ends up providing a key solution or otherwise outsmarting intelligence professionals—a resolution drawn from fantasy rather than real life. World War II. As World War II began, Hitchcock released Foreign Correspondent (1940). The war years featured numerous films depicting Nazi, Japanese, and Allied espionage, and in this era before the establishment of the Central Intelligence Agency (CIA), the spy-hunters were usually special agents in the Federal Bureau of Investigation (FBI). up as a pair of amateur spy-hunters chasing Nazis in Washington, D.C. More accurate portrayals of espionage in World War II—e.g., The Man Who Never Was (1956) and Eye of the Needle (1981, based on a Ken Follett novel of the same title)—had to wait until after the war was over. A rare exception to the less-than-serious treatment of espionage during the war years actually appeared at the very beginning of the war: Warner Brothers' Confessions of a Nazi Spy (1939), starring Edward G. Robinson. As Michael E. Birdwell's 1999 book Celluloid Soldiers attested, Jack and Harry Warner were the first major figures in Hollywood to address Nazism, and at a time when the United States remained isolationist, this made Confessions a controversial film. According to Birdwell, members of the cast and crew received threats during production, and upon its release, the U.S. Senate called for an investigation of "war-mongering propaganda." Ironically, hearings began in October 1941, just two months before America entered the war against Germany. The early Cold War period. Espionage movies, like espionage itself, especially flourished in the Cold War era. Such films as The Iron Curtain (1948) and The Third Man (1949), with a screenplay by Graham Greene, gave early notice of the high quality of the portrayals. This high quality continued throughout the early Cold War era, with offerings that included Our Man in Havana (1959, with a screenplay by Greene adapted from his novel); The Manchurian Candidate (1962), based on a Richard Condon novel involving brainwashing in the Korean War; and The Spy Who Came in from the Cold (1965), from a John Le Carré novel. Hitchcock easily made the move to Cold War espionage with works such as his remake of The Man Who Knew Too Much (1955), now in a Cold War setting with James Stewart. North by Northwest (1959) returned to the theme of the innocent—played in this case by Cary Grant—caught in the middle of a vast international conspiracy. The title of a less well-known, but still critically acclaimed Hitchcock offering from this era, Torn Curtain (1966), with Paul Newman and Julie Andrews, refers not to a piece of fabric, but to the iron curtain. By the late 1950s, depictions of espionage had reached a point at which filmmakers and TV producers could take an entirely different approach. Instead of portraying covert action with the utmost of seriousness, these activities became fodder either for comedy or outlandish fantasy with a comedic twist. No greater example of this trend existed than James Bond, hero of 14 novels by Ian Fleming, himself a British intelligence officer. Bond, Agent 007 in British intelligence, has a license to kill, and he uses that license—along with the audience's willful suspension of disbelief—to the utmost in his endless operations against the Soviet-style organization known as Smersh. Whereas the Bond of Fleming's books has a cerebral, serious quality, on screen his exploits are so outlandish as to be comical—and intentionally so. As unbelievable as Bond's ability to come away unscathed from every adventure are his seemingly endless seductions of beautiful women, none of whom make any serious emotional demands on him, although several do try to kill him. For all their apparently unrealistic qualities, the Bond films draw on elements of reality. Smersh was a real Soviet organization, founded by Josef Stalin, and the use of the initial "M" for Bond's boss is a play on the "C" used to designate real-life heads of MI6, the British Secret Intelligence Service. Another figure with an initial for a name, "Q," serves a function not unlike that of the Directorate of Science and Technology at the CIA. It is Q's job to supply Bond with technologically sophisticated, extremely efficient gadgetry designed to help him meet any challenge. These gadgets are a key feature of the Bond movies, and of other espionage films and TV shows in later years, such as Mission: Impossible and Get Smart. Many of the devices that seemed otherworldly in the 1960s—wireless telephones, films on silver discs, and computers small enough to fit into the palm of one's hand—are part of everyday life today. The first Bond book became Casino Royale (1953), with David Niven as Bond, but the true Bond film canon begins with Dr. No 10 years later. The movie was the first in the series to feature Sean Connery, the actor most widely praised for his portrayals of Bond, and it introduced the first of many beautiful "Bond girls," Ursula Andress. With sexual liberation on the rise, and feminism still lagging behind at that time, subsequent Bond films featured numerous gorgeous sidekicks, seduced by Bond, only to be conveniently eliminated at some point, leaving the hero free to seek further partners in a future adventure. Connery perfected his Bond persona over the course of four more movies in the 1960s: From Russia, with Love (1963), Goldfinger (1964), Thunderball (1965), and You Only Live Twice (1967). Fashion model George Lazenby took over the Bond role in On Her Majesty's Secret Service (1969), but proved to be the least critically and popularly successful of all Bonds. Connery played Bond a fifth time in Diamonds Are Forever (1971). The next five Bond movies featured Roger Moore: Live and Let Die (1973), The Man with the Golden Gun (1974), The Spy Who Loved Me (1977), Moonraker (1979), and For Your Eyes Only. The last was released in June 1983, four months before Connery reappeared in a low-budget, critically panned final Bond performance, Never Say Never Again (1983). After Moore played Bond a sixth and final time in A View to a Kill (1985), Timothy Dalton took over in The Living Daylights (1987). At this point, producers had expended all novels, screenplays, and treatments by Fleming, who died in 1964. The first Bond film that did not feature Fleming's work was Licence to Kill (1989), also starring Dalton. The franchise went silent for six years, then revived in the mid-1990s with a series of films starring Pierce Brosnan as Bond: Golden Eye (1995), Tomorrow Never Dies (1997), The World Is Not Enough (1999), and Die Another Day (2002). Cold War reality also mingled with humor in the black comedy Dr. Strangelove; or, How I Learned to Stop Worrying and Love the Bomb (1964). 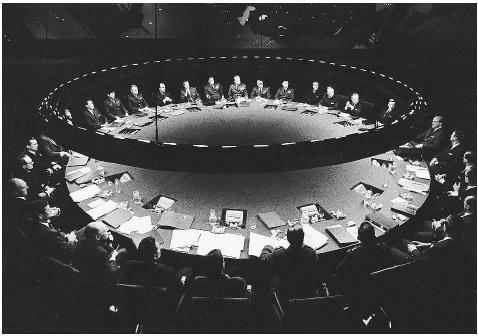 Peter Sellers impersonated both United States and Soviet leaders in the doomsday film, which culminates in an inadvertent global thermonuclear war. Television, fantasy, and humor. Simultaneous with the heyday of Bond movies in the 1960s was the advent of television shows with an approach to espionage that was either fantastic, humorous, or both. Among these were the The Avengers, which debuted in 1961; The Man from U.N.C.L.E. (1964); Get Smart (1965), which, like U.N.C.L.E. and Bond, was heavy on gadgetry, with another Smersh-like enemy called CHAOS; The Wild Wild West (1965), which cleverly backdated modern intrigue and technology, setting them in the old West; I Spy (1965), the first television show featuring an African American star, Bill Cosby; Mission: Impossible (1966), which sometimes bordered on a serious portrayal of special operations, and which spawned two films starring Tom Cruise in the 1990s; and The Prisoner (1967). The comedic is a recurring element of espionage films of the 1970s and beyond, including The In-Laws (1979), which was remade in 2003; Dead Men Don't Wear Plaid (1982), with Steve Martin; a number of Leslie Nielsen movies, in which Nielsen plays a bumbling intelligence or law enforcement officer; and True Lies (1994), which mixes a semi-serious portrayal of an organization akin to the CIA with comedic touches, courtesy of Tom Arnold and Arnold Schwarzenegger. Particularly successful have been the film series spawned by two 1997 espionage spoofs. Austin Powers: International Man of Mystery, in which Mike Myers plays an unlikely James Bond figure, led to two sequels, and Men in Black, starring Tommy Lee Jones and Will Smith, has had one. The latter series plays off of conspiracy theories concerning U.S. intelligence and studies of unidentified flying objects (UFOs) in the late 1940s and beyond, taking as its premise the idea that the UFOs actually were alien spacecraft—a fact that the government has concealed from the populace. The period from the 1970s onward has seen an everexpanding variety of films that treat espionage, intelligence, special operations, or terrorism. Notable early examples from this period include The Day of the Jackal (1973), The Conversation (1974), and Three Days of the Condor (1975). Some other critically or popular acclaimed films have included Another Country (1984), about the formative years of British turncoat Guy Burgess; Terminator (1984) and Terminator 2 (1991), with Schwarzenegger as an assassin from the future; and Proof of Life (2000), in which Russell Crowe plays an undercover operative in the private sector who rescues hostages from terrorist kidnappers. As time has gone on, the nature of protagonists has evolved from the early emphasis on single white males in the mold of James Bond. Enter the Dragon (1973) features an Asian main character, played by Bruce Lee, who spies on a drug cartel while taking part in a martial arts competition. Numerous "blaxploitation" movies of the 1970s feature African American law enforcement or intelligence operatives who usually uncover white perfidy and black collusion. By 2002, Undercover Brother spoofed these themes with its portrayal of an all-black intelligence organization called The Brotherhood, which is pitted against white enemies that include White She-Devil and The Man, both of them affiliated with the evil Operation Whitewash. In Undercover Blues (1993), the spy team consists of a married couple (Dennis Quaid and Kathleen Turner) with a six-month-old baby. By then, women protagonists in espionage films were far from unusual. The mid-1980s featured a number of such films with female protagonists, examples being The Little Drummer Girl (adapted from a Le Carre novel, 1984), Jumpin' Jack Flash (1986), and Outrageous Fortune (1987). All of these—starring Diane Keaton, Whoopi Goldberg, and Shelley Long respectively—played on the theme, made famous by Hitchcock, of the innocent caught up in clandestine activities. Confessions of a Dangerous Mind (2002) took this "innocent" theme a step further, with its tale of Gong Show host Chuck Barris's alleged recruitment by U.S. intelligence. Drummer Girl and Jackal (from a book by Frederick Forsythe) were just two of many book adaptations from the late twentieth and early twenty-first centuries. Particularly notable in this regard were adaptations of Tom Clancy's Jack Ryan books, with Alec Baldwin playing Ryan in The Hunt for Red October (1990); Harrison Ford in Patriot Games (1992) and Clear and Present Danger (1994); and Ben Affleck in The Sum of All Fears (2002). Two books published much earlier, Mother Night by Kurt Vonnegut and The Bourne Identity by Robert Ludlum, were finally adapted for the screen in 1996 and 2002 respectively. Terrorism. Patriot Games was just one of many films about terrorism, and terrorism in Northern Ireland particularly. The trend began in the 1970s, as terrorism became an increasingly common element of modern life. Black Sunday (1977) portrayed fictional events, but many more have, either through drama or documentary, depicted real ones. Examples include 21 Hours at Munich (1976), Hijacking of the Achille Lauro (1989) and Voyage of Terror: The Achille Lauro Affair (1990), and The Tragedy of Flight 103: The Inside Story (1990). The first World Trade Center bombing was the subject of Without Warning: Terror in the Towers (1993), while several documentaries, including 9–11: American Reflections (2001), 9/11 (2002), and WTC: The First 24 Hours (2002), have portrayed the second attack. Films on the Northern Ireland theme include Harry's Game (1982), The Crying Game (1992), In the Name of the Father (1993), Michael Collins (1996), The Boxer (1997), The Devil's Own (1997), and The Jackal (1997), a critically panned remake of Day of the Jackal with a change of scenery and characters. Depictions of terrorist-controlled hostage scenarios became popular after the success of Die Hard (1988). Many of these have featured airplanes, examples being Die Hard 2 (1990), Passenger 57 (1992), Executive Decision (1996), and Air Force One (1997). The plot of Barcelona (1994) includes terrorism of the Cold War era, while Brazil (1985) presents a vision of terrorism in the future. After the real-life events of September 2001, the theme has proven less popular in films. As a result of the bombings, Warner Brothers delayed release of its terrorist-related Collateral Damage (2002), which starred Schwarzenegger. Birdwell, Michael E. Celluloid Soldiers: The Warner Bros. Campaign Against Nazism. New York: New York University Press, 1999. Gregg, Robert. International Relations on Film. Boulder, CO: Lynne Rienner Publishers, 1998. Lisanti, Tom, and Louis Paul. Film Fatales: Women in Espionage Films and Television, 1962–1973. Jefferson, NC: McFarland, 2002. Mavis, Paul. The Espionage Filmography: United States Releases, 1898 Through 1999. Jefferson, NC: McFarland, 2001. Internet Movie Database. < http://us.imdb.com > (April 30, 2003).